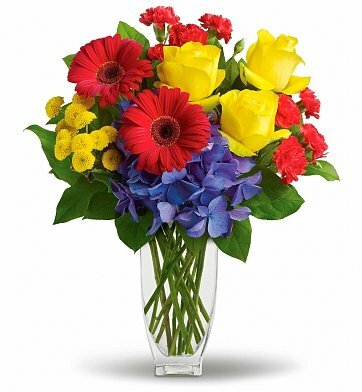 Celebrate a birthday, express congratulations, or simply let someone know they are special with this wonderfully colorful bouquet of fresh flowers. Beautiful blossoms such as hydrangea, yellow roses, gerberas, miniature carnations, and button spray chrysanthemums fill a contemporary vase. With their bright coloration and fresh fragrance, the flowers are sure to bring a smile to the recipient's face. A free gift card with personal message. Arrives in a stylish glass vase. Hand delivered to the recipient's home or office by experienced florists. A plush teddy bear, balloons, wine, champagne, or chocolates may be added to your order based on availability. Please contact customer service for more information. Measures approximately 16" x 20". During checkout, please be sure to indicate your preferred occasion when you choose a gift card. Exact flowers and vase may vary depending upon location and availability. Here's to You Bouquet is a hand delivered gift. These gifts are delivered by one of our local design centers located throughout the United States and Canada. Same day delivery is available for most gifts when ordered before the cutoff time. The cutoff time for Here's to You Bouquet is 2 PM in the recipient's time zone. Carla enjoyed receiving the flowers. I didn't know about the other things you offered, or I would have included something else with the flowers, i.e. fruit, etc. Flowers arrived looking more than amazing!